If you're like me, you like to see what everyone carries with them in their purse. Here is a look at the way WAY too many things I carry! So this is why my bag feels like a ton of bricks! How many lipsticks does Sarah need at all times? Apparently about 8. I am just very into lip stains as the stickyness of lip gloss is not appealing. Hair stuck to my lips? Count me out. However, the Revlon colorbursts (I have 016 Bordeaux) are awesome. A bit sticky, but nothing serious. My Clinique chubby stick is in 05 chunky cherry, my Mac lipstick is a luster shade in A31 Lustering, and Maybelline Color Sensational is in 045 Pink me Up. It is the best lipstick I own and the color is PERFECT for everyday. It is a subtle pink, so not too much for daytime, but the softness is amazing. So pigmented and long lasting with the feel of a Chapstick! Last but not least, my Revlon Just Bittens are Victorian, Desire, and Passion (going down from the Clinique chubby stick!) and I'm pretty sure Victorian is my favorite, this week. My Rimmel eyeliner is in 021 Denim and the navy makes my eyes look so green! The mini size is perfect to carry in my purse for touch ups! My Ralph Lauren wristlet is one of my favorite "adult" purchases I've bought. I really wanted a Michael Kors one, but when I saw this silky soft light brown leather with a gold monogram, I was completely sold. I don't even think I checked he price tag...never a good idea. I love the way it has side pockets and a middle pocket, which I where I keep my phone and a soft lips chapstick! I also have my dining license and old movie tickets, #hoarder. While my Vera Bradley mini notepad isn't very unique, it is perfect for my purse since it's so tiny! Plus it used to be my sisters so I like to look at her writing and see her old lists, it's comforting. The more unique items I carry are a 2 dollar bill signed by the representative from District 22 in Louisiana (I carry it for good luck!) and rose petals from St. Rita. My grandparents just brought it back from Italy for me! I'm not really sure why I carry this around with me, as there's really no need, but it's my Chi Omega badge/pin! I got it when I was initiated and I've just always kept it with me! My monogrammed sunnies from Marley Lilly are perfection. I never used to wear sunglasses, and to be honest I rarely wear them now, but I always keep them with me just in case! They're nice to have when I remember how bad squinting is for wrinkles! 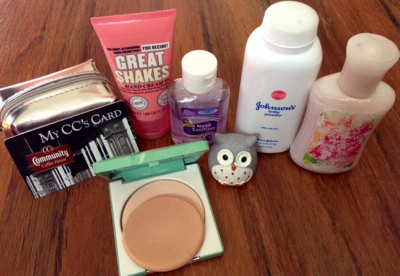 The last few things is my Clinique matte powder in bisque (life saver), my CC's gift card for coffee, my little pouch with about 100 mini sized things like hair bands, deodorant, earrings backs, and all sorts of things (I'll link you to one here, I'm obsessed), my great shakes hand cream from Soap and Glory, my lavender hand sanitizer (one of many), my owl lip balm, my baby powder for when I'm at a friends or on vacation and need to fix my hurr, and my sweet pea hand cream (so old hence the ruined label, but I love the smell!). So that's about it! I also carry bobby pins and hair ties but I've been too lazy to refill them since I've used the ones I had and never put any back in! Things I didn't talk about that we're in the main picture are my checkbook (self explanatory), my Orbit gum (must have at all times #wintermint), and my hand mirror (bedazzled, of course), my Betsey Johnson watch, an iPhone charger block, and my keys! Hope you enjoyed that little sneaky peek into my bag! What are your must haves? Is there something you always have in your purse that I didn't mention? I absolutely LOVE these kinds of posts!! Now, to add to the list of things that make us scarily alike: I carry around the same Revlon lipstick and Clinique powder in the same colours and the same Soap and Glory hand cream! Plus, I am so in love with your Ralph Lauren wristlet!! oh my gosh, that is so funny! Btw, I totally think if you did one, I'd be obsessed! I love seeing what other people carry! And yes, my wristlet was my first more adult purchase because I always carried cotton Vera Bradley ones, so I love it even more! The leather is so soft and classy looking...but now I want the clutch version. oops.